Lift 47: "The Waterfall" — Inclined Elevation Inc. The owners needed a lift to connect their cottage with their dock 8 stories below. It was a challenge to even find a spot to locate the lift and not interfere with the view of the lake from the cottage. Once designed, it was a challenging build to say the least. Fitting the track to the connect the upper and lower stations was a complicated exercise itself and the actual build required mountain climbing gear that we used to rappel ourselves, our equipment, and even the track itself, down the hill. The resulting lift is so striking that the locals make it a boating destination and call it "The Waterfall". It's a highlight on the Lady Muskoka Boat Cruise. The upper station, "The View", is off the side of the main cottage deck, and required a 2-oitch. Because the short upper section is relatively flat at 30° the motor housing remains unobtrusively below rail level. The lift is in an convenient spot and doesn’t impede the view of the lake or the sunsets. When people say it looks scary I see the rickety stairs in the distance and think this is so much safer. If first time riders watch the lift go up and down they're reassured and ready to ride. If you were riding this lift with your eyes closed, you'd have no idea that the pitch of the track had changed, it's that smooth. We once put a full wine glass on the outside top corner of the car railing and it rode up and down without any concerns. The stairs at this cottage were a steep, arduous climb. 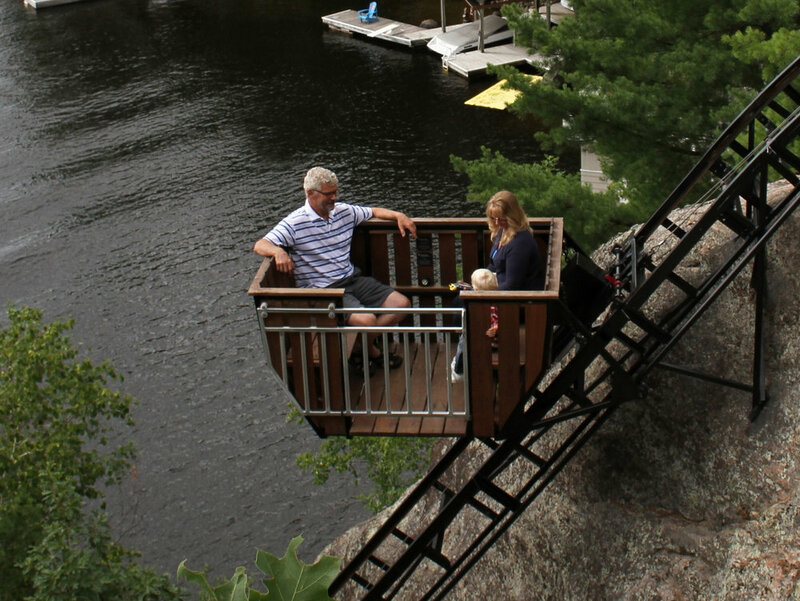 The owners now enjoy a spectacular 90-second lift ride from the dock to the cottage deck. This is about as exposed a lift as we've built but it's not an eyesore, in fact the locals enjoy it too, stopping in their boats on their way by to take in "The Waterfall". The lower section of track is 53°, our third-steepest track to that date and our steepest two-pitch taken during the build. We added the small triangular piece to the dock, it was not finished at the time this photo was taken, to construct the lower station. Matthew Haley is adding finishing details to the car. This video was filmed and edited by the very talented Bet Smith who also wrote, plays, and sings the accompanying song. Bet was our build team welder in 2014. This one of our most dramatic installations and really has to be seen to be fully appreciated.